On the 15th of June, I headed down to Virgin Money Lounge in London’s Piccadilly, where CLC World Charity Fund and Cystic Fibrosis Holiday Fund were launching Family Revitalise 2017. Cystic Fibrosis is a genetic condition affecting over 10,000 people in the UK alone. Cystic Fibrosis dominates their everyday routine and reduces their life-span drastically. The Family Revitalise 2017 project is hoping to provide 30 fully funded holidays in 2017 to families in need. 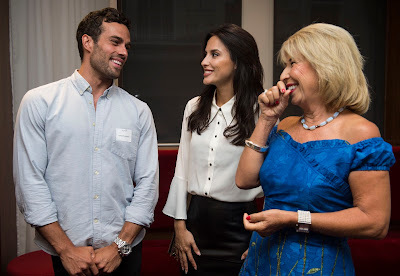 The launch was attended by CLC World’s brand ambassador, Jennie Bond, E4’s Made in Chelsea – Lucy Watson and James Dunmore, who the holds the cause close to his heart having lost both his sisters to the disease. Martin Luke Brown performed his beautiful song 65 roses. He wrote for his girlfriend who he lost to Cystic Fibrosis. 65 roses is what some children with Cystic Fibrosis call their condition because it is much easier for them to say. Cystic Fibrosis Holiday Fund is aiming to raise £28,200 to send another 23 families on fully funded holidays before Christmas 2017.